Iunost’, idi! (Youth, Go!) is an early Soviet motivational manual on how to become an exceptional worker and efficient manager. 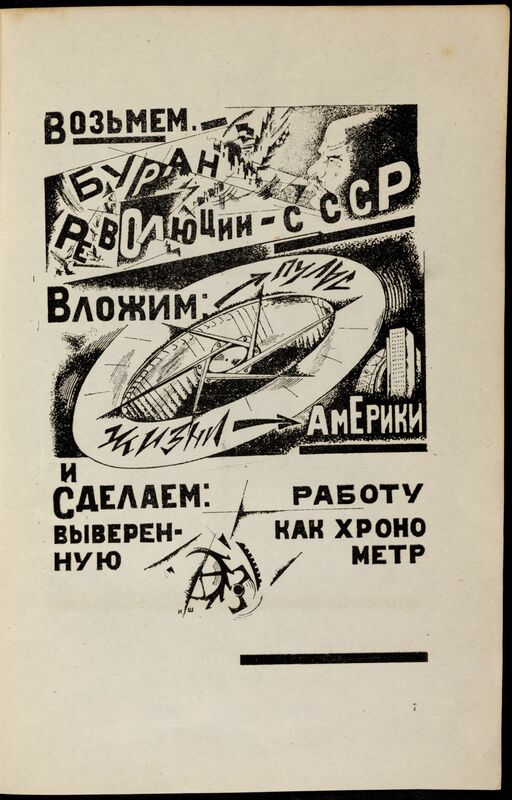 Its images, and the slogans that accompany them both within the frame and on opposing pages, are intended to inspire Soviet youth to become the leaders of the Soviet future by training their bodies and their minds to act like high-performance machines. The book was published by the All-Union Central Council of Trade Union (VTsSPS), and the previous works of its author, A. Gastev, are dedicated to the theme of labour, including such titles as How to Work and The Industrial World. For this book the VTsSPS commissioned drawings from artists working in leading avant-garde styles such as Cubo-Futurism and Constructivism. With the exception of the cover, which is executed in bold primary colors (black, white and red), all of the sixteen pen-and-ink drawings in this book are in striking black and white. The inclusion of bold typography in every image (generally with the aim of expressing spirited commands to the viewer) is typical of the Cubo-Futurist aesthetic, as is the focus on speed and technology. Many of the images convey the speed of motion by capturing action in several perspectives at once, or in angular planes and arrested gestures. The images also contain elements of Constructivism, which expressed robust physicality, dynamic movement and workaday functionality.